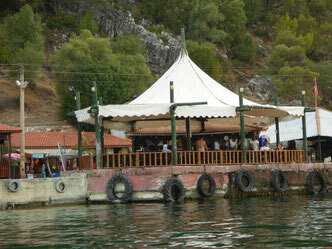 Dalyan is a perfect holiday destination: it has something to offer for everyone. Once a quiet fisherman's village, Dalyan developed into a lovely, small scale tourist town. The center is full of little restaurants, bars and shops, where you will meet and get to know the local people. You can relax by the pool or on the beautiful beach, where the sea is safe and suits all ages. There are many activities in and around Dalyan, varying from walking, cycling, boat tours, jeep safaris, visiting local markets to exploring historical sites. Below you find a small selection of things to see and do. One of the last unspoilt beaches on Turkey's coast. 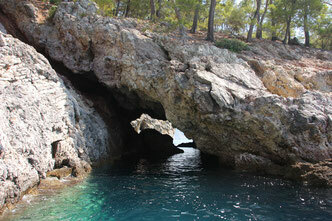 The water is crystal clear and the shallow and calm water makes it suitable for everyone to enjoy a swim. The beach is protected, because of the endangered Carretta Carretta turtle that lays her eggs in the sand. Don't miss a visit to the Turtle Sanctuary. 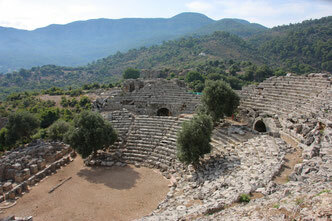 Kaunos is the ancient city on the other side of the river. Apart from the eye catching rock tombes, there's a whole site to explore. Not only interesting for historical reasons; the walk up there is lovely, past pomegranate and orange orchards and little farms, and the views on the delta are worth the climb. 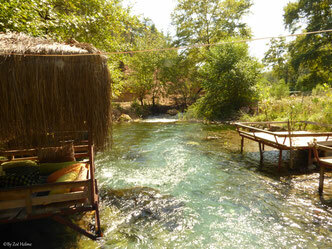 People have been coming here for thousands of years, to bathe in the healing thermal waters of Sultaniye. Around the original bath, you find the remains of pillars and walls dating from Roman times. The water has a strong sulphur smell, but once you're in it, the hot water definitely has a relaxing effect. 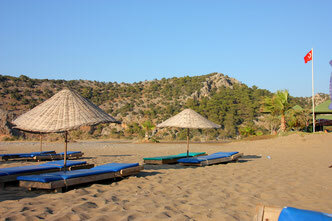 Sea, river and lake: Dalyan has it all. So there is no better way to explore this beautiful part of the south coast than on one or several boat trips. Whether you do a day trip, moonlight trip or 'just' the boat ride to the beach, every tour gives you stunning views, a chance to spot wildlife and enjoy the crystal clear waters. You can visit several waterfalls on an organised trip or by yourself with a hired car or bike. It takes you on an adventurous ride and walk off the beaten track, through remote villages and forests. The ice cold water is very refreshing on a hot day and you can treat yourself on a delicious lunch of fresh trout while sitting on the river. Markets are perfect for both shopping as well as seeing something of the daily life. The Dalyan market is nice and small, with an area full of locally grown fruits and vegetables and spices, cheeses and honey, but also a part full of souvenirs to take home. 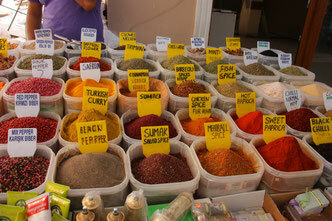 Other markets in the area are less touristy, and well worth a visit.